My little girl turned five yesterday. And what birthday girl doesn’t want a beautiful cake. As Miss K and I searched cookbooks and the internet for the perfect cake to bake, she decided she wanted a Chocolate Cake with Raspberry Frosting. The raspberries on the top were her idea and very crucial to her having the perfect birthday cake. I must say that layer cakes are a little intimidating to me, as you will find there are none here on Caramel Potatoes. However, by not having to frost the sides, I found this cake to be so simple. Add the fresh raspberries on top made for a pretty presentation with little effort. I must say miss K. loved her cake and was quite proud to show it off to everyone before eating it. Luckily for me, the cake tasted as good as it looked. So Happy 5th Birthday miss K! FOR THE CAKE: Adjust oven rack to middle position; heat oven to 350 degrees. Grease two 9-inch-round by 2-inch-high cake pans with softened butter; dust pans with flour and knock out excess. Combine chocolate, cocoa powder, and hot water in medium heatproof bowl; set bowl over saucepan containing 1 inch of simmering water and stir with rubber spatula until chocolate is melted, about 2 minutes. Add 1/2 cup sugar to chocolate mixture and stir until thick and glossy, 1 to 2 minutes. Remove bowl from heat and set aside to cool. Whisk flour, baking soda, and salt in medium bowl. Combine buttermilk and vanilla in small bowl. In bowl of standing mixer fitted with whisk attachment, whisk eggs and yolks on medium-low speed until combined, about 10 seconds. Add remaining 1 1/4 cups sugar, increase speed to high, and whisk until fluffy and lightened in color, 2 to 3 minutes. Replace whisk with paddle attachment. Add cooled chocolate mixture to egg/sugar mixture and mix on medium speed until thoroughly incorporated, 30 to 45 seconds, pausing to scrape down sides of bowl with rubber spatula as needed. Add softened butter one tablespoon at a time, mixing about 10 seconds after each addition. Add about one-third of flour mixture followed by half of buttermilk mixture, mixing until incorporated after each addition (about 15 seconds). Repeat using half of remaining flour mixture and all of remaining buttermilk mixture (batter may appear separated). Scrape down sides of bowl and add remaining flour mixture; mix at medium-low speed until batter is thoroughly combined, about 15 seconds. Remove bowl from mixer and fold batter once or twice with rubber spatula to incorporate any remaining flour. Divide batter evenly between prepared cake pans; smooth batter to edges of pan with spatula. Bake cakes until toothpick inserted into center comes out with a few crumbs attached, 25 to 30 minutes. Cool cakes in pans 15 minutes, then invert onto wire rack. Cool cakes to room temperature before frosting, 45 to 60 minutes. 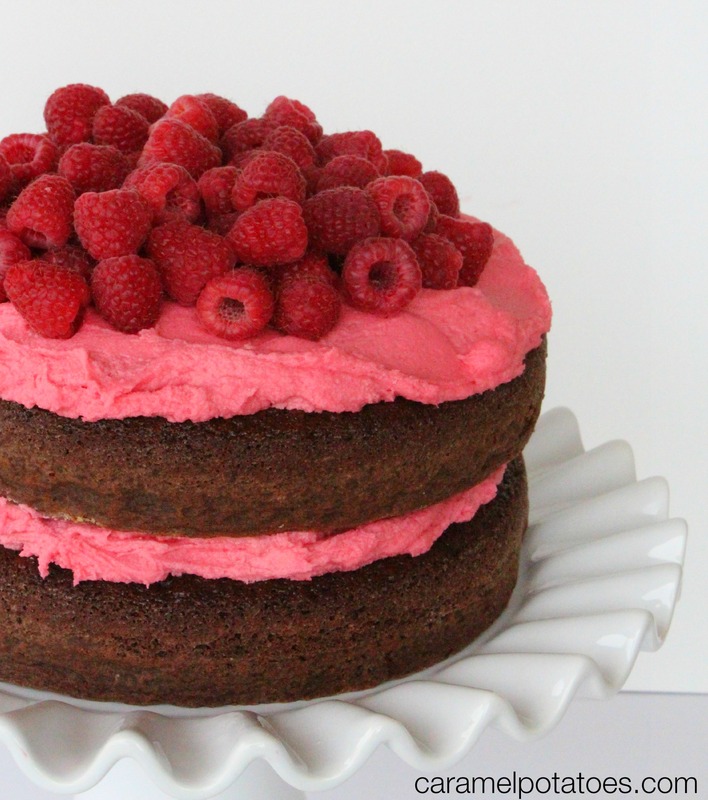 FOR THE FROSTING: In a food processor or blender, puree the raspberries. Pour raspberries through a fine sieve, pressing on solids to remove the seeds from the puree. Place the butter, 2 cups powdered sugar and the puree into mixing bowl. Beat on low until well blended. Continue adding the remaining sugar, beating well after each addition until all has been added. Scrape down sides of the bowl and beat on medium speed until frosting is light and fluffy. Generously frost one of the cakes, stacking the other on top. 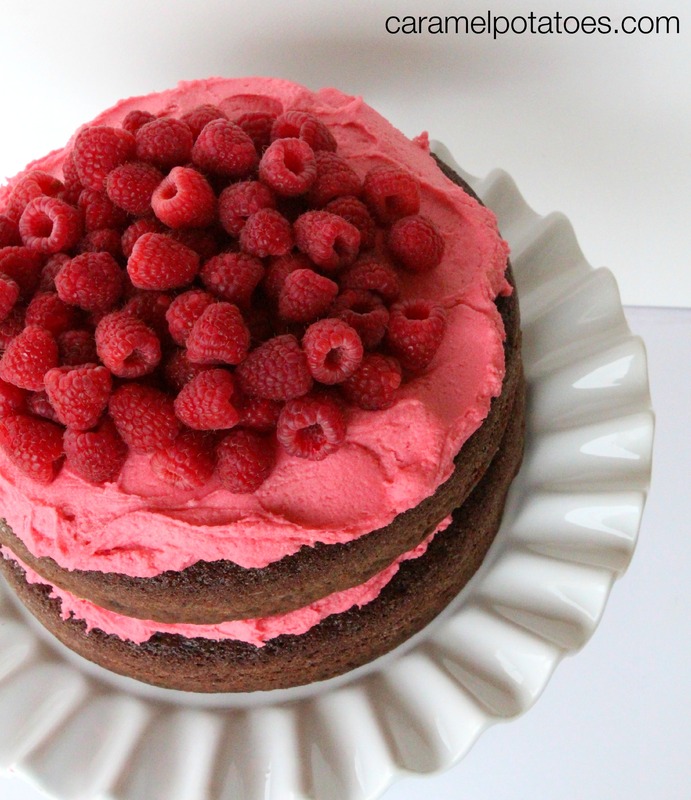 Top with remaining frosting and additional raspberries if desired. Serve. Store leftovers in the refrigerator. *Chocolate Cake recipe from America’s Test Kitchen. This looks incredible! I’m not very good at making cakes, but I think I could do this. Oh that looks so pretty and delicious!